The band's fifth ZOHO CD again pays tribute to 1950s and 60s Soul and R&B artists. This time they dug back even further to songs by Roosevelt Sykes from 1929, and by Blind Willie Johnson from 1930, performed in their signature Texas Blues style. 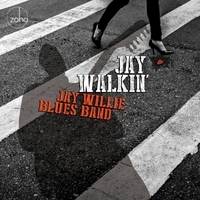 We are proud to release Jay Walkin’, the Jay Willie Blues Band’s fifth consecutive release with Jochen Becker and his New York based ZOHO Music label. What is consistent with all these releases is that the cover songs on them pay tribute to the 1950s and 60s Soul and Rhythm & Blues artists who created some of the best music of our time. This time we dug even further back to 1929, featuring a song by Roosevelt Sykes, and 1930 with a song by Blind Willie Johnson. This eclectic mix is complemented by our originals that we trust you will find infuriating, crude, and tasteless …. no, just kidding ! … edifying, danceable, and entertaining. While we believed that our last release from 2016, “Hell on Wheels” (ZOHO ZM201612) would be a tough act to follow for us, our opinion is now that this record is our best to date. This was our first project with Engineer Paul Opalach and Long Hill Recording Studio here in Shelton, CT. Our drummer Bobby T Torello had worked with Paul on past projects and suggested that I talk with Paul about a session. I told Bobby I was not financially prepared to produce a new record and Paul very graciously offered me a free session so I could decide if I would like to do any future projects with Long Hill. The studio might not be fancy to look at, but it was proof that a book should never be judged by its cover. The first track that we did together during the free session was Dale Hawkins’ recording of Wish I hadn’t Called Home. I am a fan of Dale Hawkins’ best known for his song Suzy Q and wanted to record this less popular song from 1961 that still has that Louisiana Swamp Rock boogie vibe that Dale is noted for. I had sent Paul the original Dale Hawkins acoustic version to familiarize him with the song. After Bobby made the introductions with Paul, I plugged in my guitar to play our interpretation of the track with Bobby T. To my surprise, Paul had already recorded the bass and electric drums to a click track so that he had a good baseline to work with. Bobby then did his drum track, Paul did the bass track over and I finished overdubbing the guitar and vocals. I had some skepticism of this sequential recording technique without the full band playing together, thinking that there could be a loss of energy, but surprisingly I think it sounds tighter and creates less pressure. I got a strong sense that Paul is partial to our style of music which made for a better atmosphere and connected him to this project. The experience and sound of this session was enough to encourage me to continue with a full album. Paul is a multi-instrumentalist in addition to being a great recording engineer, and he plays bass on all tracks as well as Rickenbacker Lap Steel, Keys, and adds vocals on the title track Jay Walkin’. I again brought in two feature artists, singer Malorie Leogrande and harmonica virtuoso Jason Ricci who have both performed on our previous ZOHO ROOTS releases. Malorie is a gifted vocalist who offers an eclectic mix of Soul, Rhythm and Blues, Jazz, and Rock and Roll. She is featured on Hitting on Nothing and our cooperative original The Other Side to which she provided the lyrics. Hitting On Nothing is an Aaron Neville cover that I first heard performed by Irma Thomas AKA The Soul Queen of New Orleans. Malorie has a rare vocal quality with sweet tones and a fantastic range. This song is perfect for her and Malorie elevates it to a modern day classic reminiscent to Amy Winehouse or Adele. Jason Ricci performs on the Roosevelt Sykes cover 44 Blues. It was Bobby T’s suggestion to do this song. Jason was excited about this selection and commented that he always wanted to record a version of 44 Blues. We gave Jason free rein on this track and he not only doubled on the signature guitar riff but played through the rest of the track like nobody’s business as only Jason can. Jason also performs on the Wish I hadn’t Called Home track, adding a funky accompaniment to the rhythm with a more conservative approach overall than 44 Blues. Jay Walkin’ includes a catchy rockin’ Bob Callahan original song titled Move Over. Bob plays some great blues guitar on it as well as showcases his soulful high tenor vocal ability, covering both the lead and harmony vocal parts. Bob is also featured on How Blue Can You Get. We regularly play this song at live venues and the crowd reception is always extremely enthusiastic, so we decided to share it with a larger audience. Go To Guy is a Bobby T original that is consistent with his earlier originals comprised of high energy rock and roll with clever and witty lyrics. He asked me to play both slide and standard guitar on the track, and it was a fun combination. I could go on and add something exciting to share about every track on this album, but most importantly The Soul Of A Man is the most personal for me, as a tribute to my father Andrew Willie. I am not clear of Texas gospel blues songwriter Blind Willie Johnson’s original reference to “the soul of a man”, but to me it relates to the specific character of a person. I could elaborate extensively on my father and his wonderful qualities, and he and I also have similar taste in music. I wanted to do the song in the style of a Swamp Blues, playing two guitar parts with one incorporating a bass line. I explained this desire to Paul and he suggested that I play the guitar parts on a baritone guitar, a guitar with a larger, heavier body which allows for a lower string tuning. From his arsenal of studio equipment, Paul dragged out a baritone guitar and it was a perfect fit to create the sound I was looking for. Produced by: Jay Willie. Recorded by: Paul Opalach at Long Hill Recording Studio, Shelton, CT. Jason Ricci harmonica overdubs recorded by: Music Shed Studios and Ben Lorio. Mixed and mastered by: Paul Opalach. Photography for Malorie Leogrande by: Dennis Kwan Photography. Art direction, design and photography by: Jack Frisch. Executive producer: Joachim "Jochen" Becker.